The following list of suggested items outlines what a chalk artist might find useful when heading to a festival or chalking on their own. Large chalks are great for getting a base down. This chalk is soft and large. The colors are very vibrant. This is a smaller version of the Prang Freart and has a larger variety of blues and greens. 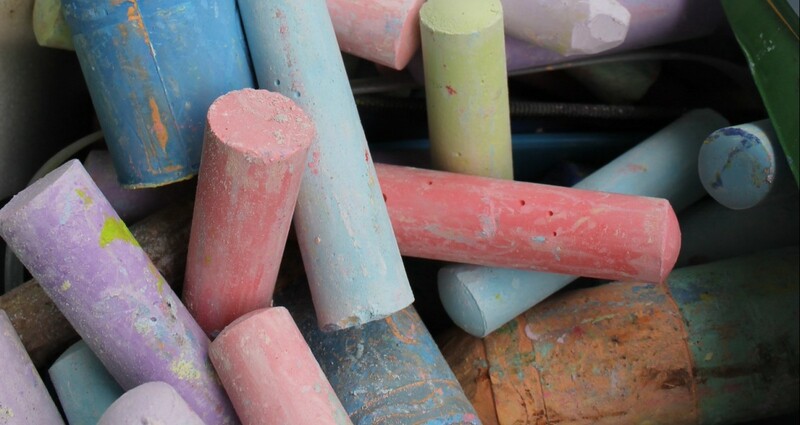 These chalks are drier than the Prang, but come in a wide variety of colors. There are easily a 100 colors to choose from. Crayola are good for skintones and filling in background color. They lack the vibrancy of Prang but they are easy to wash from the ground and are kid safe. Sargent colors are very pale and great for highlights. They aren’t vibrant but are good for filler. Koss is a hard chalk pastel that will go very far on just about any surface. It seems to be a popular brand at chalk festivals and comes in packs of 24 and 48 soft pastels. This chalk is soft and pillowy. It gets eaten by the concrete very quickly and is probably best used as an accent. The ground is hard and long days will leave your knees and wrists aching if you don’t chalk smart. Gardening pads, large sheets of cardboard, carpet squares, knee pads (left over from when you were into roller-blading) are useful for protecting your knees and wrist from the hard ground. You can also stand or kneel on pads/sheets of paper to avoid smearing completed work. Blending tools save your fingers and your time. They can make it easier to push the pigment into rough pavement or help cover large areas very quickly. Chalkboard eraser, foam brushes, carpet square samples or sheets of foam can be used for blending large areas of color. Blending sticks are helpful with small details. Sand is helpful on rough ground as is using toothbrushes. The sun is hot and will burn you. Protect yourself with sunscreen, hat, or umbrella. These help with marking off your grid and getting proportions right. Rulers can be used as straight edges. Dewalt chalk line with top loading works okay. The compact 30′ chalk line is great for travel and has an excellent string that hold chalk well. It is nice to tape off a border of your work. Also used for framing holding down tarps. For protecting against the elements, Gorilla Tape really is the best for holding things down and keeping the wet out. for overnight coverage to protect from rain, pedestrians, wind, etc. Stay organized. If you’re traveling, using something like an art bin to hold just the right amount of chalk works. Take the time to pack it away with everything you’ll need so you don’t have to go hunting for supplies when you get to your location. These are good for cleaning off your hands between colors and cleaning your face. In a pinch a moist baby wipe can pull away an errant line. for discarding used hand wipes, plastic gloves, food wrappers to keep your area clean!